Poison ivy, poison oak and poison sumac – all closely related species of the genus Toxicodendron – are the most detested and feared of all weeds. The first step in preventing trouble is taking the time to recognize the plant’s characteristics so that you may avoid it until you’re ready to remove it. Poison ivy, poison oak and poison sumac grow in a variety of forms, including vines that can climb up into the canopy of a tree and cover the trunk with a cascade of runners, twigs and leaves, small “tree” forms, and the typical ground cover. In some cases, Toxicodendron is a localized pest, but in other areas, such as the jackpine barrens of my Midwest home, it is everywhere. Leaves of three, beware of me! To identify poison ivy, look for smooth, glossy, triangular leaves occurring in groups of three. Early in the year, the leaves are small, narrow and reddish – as shown. Later in the summer, they are broad and green but may retain a reddish hue. While generally triangular, variations in leaf shape are common. 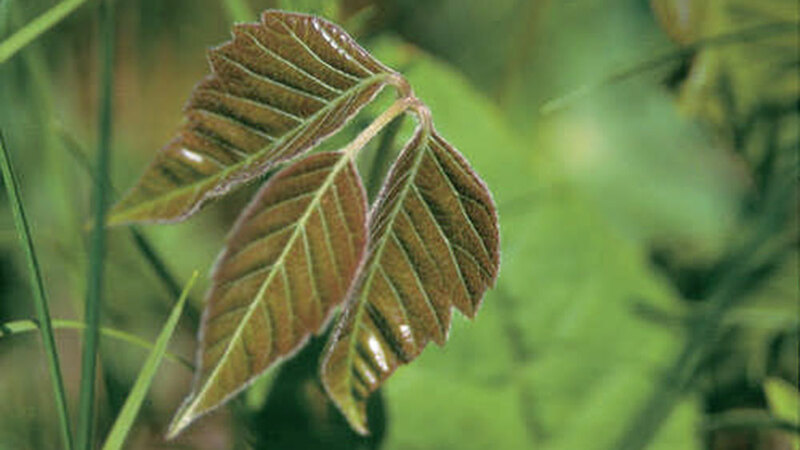 The three species – poison ivy, oak and sumac – are very similar in toxicology. The main toxic ingredient of Toxicodendron is urushiol – the stuff that causes inflammation of the skin, blisters and worse. All parts of the plant produce urushiol, including the apparently dormant woody twigs in winter. In the first minutes of contact, the oil may spread across the skin, traveling in sweat or from your hands to other parts of your body. It may also spread to you from contact with your pet’s fur. There is no immediate reaction to spreading urushiol from place to place on your body so you can be blissfully unaware until you see the blisters. Thankfully, the blisters from the inflammation do not spread the toxin further. As a person’s exposure to the various plants increases, the body’s allergic response also tends to increase. I didn’t get my first case until I was nearly 30 years old, and even now I can still routinely walk through it for hours in pursuit of woodland beauty without consequence. For my hikes in the pine barrens near my place, I keep a pair of rubber boots and overalls in my truck bed. I would hate to pass the toxic oils on to my family. Oops, Now What Can I Do? To treat exposure to poison ivy, rinse the affected area with rubbing alcohol or wash the contact area with cold water and soap followed by a long rinse of cold water. Ideally, this rinsing and washing needs to happen within 10 minutes of exposure. Warm water tends to open up the pores of the skin, welcoming the toxin home, while cold water will reduce the potential for inflammation. There are a number of over-the-counter remedies available, including the new büji Wash, a gentle scrub by Cade Laboratories that’s supposed to remove urushiol and relieve itching and inflammation. Cade also sells a block that’s supposed to protect you from poison ivy/oak. This writer, however, is reluctant to conduct field testing! 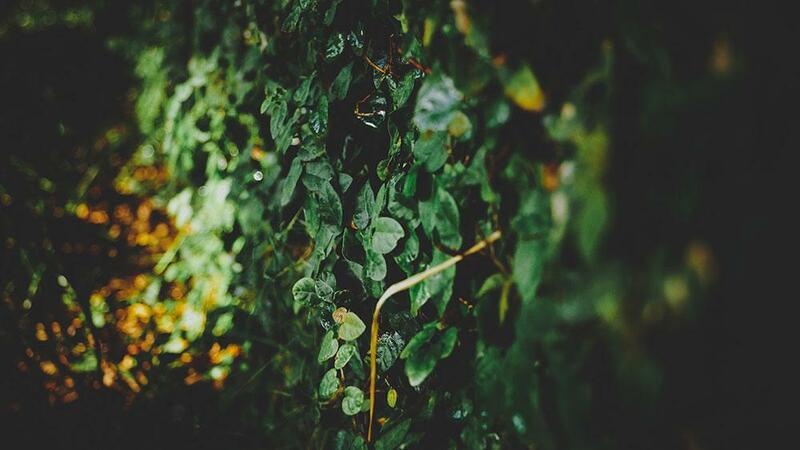 When removal of poison ivy, oak and sumac from your property becomes a priority, you really need to pay attention to the details so that you and your target don’t tangle toward a similar fate. Though I am not one to merrily encourage the spraying of chemicals all over planet earth, the most effective tool in the battle against poison ivy and its kin is to treat the leaves directly with an herbicide meant for woody and brushy plants. Of course, you want to be sure your treatment is very narrowly applied to the plants so you don’t harm nearby trees and pollute waterways. A good brush killer, applied by closely following the manufacturer’s directions, will work in the long term. To beat poison ivy, a tough plant, you will likely need to revisit the same location for repeated applications of herbicide. Small plants may be dug out and shoveled directly into a plastic garbage bag, and, with great care, plants may be repeatedly trimmed to starve the roots. In waging this particular battle, work smart: Wear long sleeves, long pants, work boots and gloves. And don’t wipe the sweat from your forehead with your sleeve or glove! Beauty and the beast. 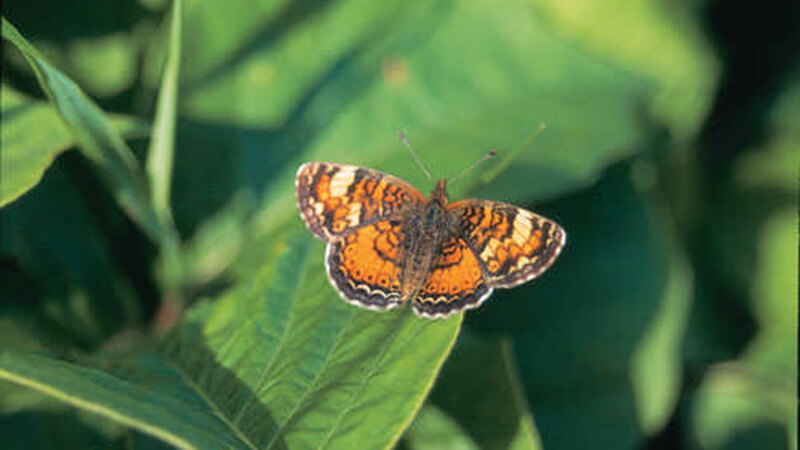 This butterfly won’t bring the oils of poison ivy to your skin, but your family dog might! Dense mats of poison ivy may be found along stream banks, in open sandy soil, in roadside ditches, along the edges of woodlands and may even be found in some forests growing as high as 20-30 feet in vine form. • Don’t use a motorized weed trimmer for fear of dreaded urushiol shrapnel. • Never compost it and don’t assume that dead plants won’t hurt you. • Don’t ever listen to that old wise man down the lane who says he eats a leaf every summer to keep himself from becoming allergic. He has been playing a potentially deadly roulette. • Avoid the temptation to get down in the patch and start weeding. To those of us who are allergic, this is obvious. If you are one of the people not yet affected – well, this type of behavior could change that. • Don’t make the mistake of burning the remains of dead plants, sending plumes of urushiol smoke into the air for all to breathe. If you think poison ivy is tough on skin, imagine what it can do to lungs! Learn to identify the enemy, respect the danger – and, hey, be careful out there. Brian M. Collins is a high school biology teacher and a nature photographer. You can check out his work at www.imagesinnaturallight.com.